“There are those who rebel against the light, who do not know its ways or stay in its paths” (Job 24:13). I guess if it’s okay for my Christian friends to post their dark and evil Halloween pictures on Facebook and other places, it must be okay for me to wonder why they took part in the holiday at all. It just doesn’t compute in ‘my renewed mind’ how one can say they believe in the resurrection of the dead because Jesus rose from the dead and then dress like dead people, zombies, skeletons. It makes no sense that anyone would want to redeem this wicked, lawless, holiday for Christ. I just can’t wrap my brain around how anyone who claims to be a Christian justifies honoring a holiday that Jesus would never have done or condoned because of its darkness. Jesus called us “out of the darkness into His glorious light” (1 Peter 2:9). Do Christians even shudder at the thought of demons they play with and dress like? They must have forgotten that Jesus cast demons out of people who knew what it was like to be possessed. “You believe that “God is one”? Good for you! The demons believe it too — the thought makes them shudder with fear!” (James 2:13). “So he traveled throughout Galilee, preaching in their synagogues and driving out demons” (Mark 1:39). God used Halloween to set me free from demonic things in my life by showing me demons hanging on people who were ‘harmlessly’ dressed up and unknowingly partying with their possessor on Halloween. It was the most eye-opening moment in my life and changed my spiritual direction drastically. Unfortunately, the gift of discerning spirits isn’t one of the more tolerated gifts in the Body of Christ because so many who are supposed to be holy to the Lord have embraced the world and rationalize their behavior with the world. You adulterous people, don’t you know that friendship with the world means enmity against God? Therefore, anyone who chooses to be a friend of the world becomes an enemy of God” (James 4:4). Whether or not a Christian realizes it, they will stand before God one day and give an account of their lives. They will have to explain to the King of Kings why they celebrated a holiday that mocked the Father and Creator of Life and His Son who died to bring them life (Romans 14:10). I pray for those Christians I know who embrace the death celebration and its trappings through Halloween. The burden on my soul and spirit becomes so great during this time of year. It’s exhausting and draining because I can literally see the evil. Each year my prayer list gets longer because there is a great falling away. Those who didn’t take part in the darkness just a few years ago are doing so now. This year my prayers included an entire local church. I hope that someday each person who I prayed for comes to understand the darkness they have embraced and how the Light of the World continues to shine in the darkness calling them out. A friend posted a Scripture from Revelation 22:11-12 and it seems appropriate to conclude my post-Halloween thoughts. Today I read an excellent article by the Rev. Dr. Ed Hird about yoga and its relationship to Hinduism. He is a very courageous man to step out and reveal the hidden agenda of yoga. For years I have had similar beliefs and explained to my children, family and friends who consider yoga a wonderful exercise program that it’s roots are in demonic practices. Of course, everyone rolls their eyes at me and considers me a nut case. Like the man who wrote this article, I have the ‘unfortunate’ gift of discerning spirits. Those of us in the Body of Messiah who have been given this gift have an ignored voice because of the great deception not only in the world, but also in the church. No one wants to be told what they are doing has ‘spiritual roots’ let alone ‘evil spiritual roots’. Heck, they don’t even want to hear about things with Biblically holy roots! The world only accepts spirituality and spiritual awareness apart from Bible. The church believes that either nothing is inherently wrong because of Jesus or we can take unholy things and transform to be holy to God. Because the Rev. Dr. Hird writes exactly what I have believed over the years, I am going to share a few thoughts from his article. If you are considering yoga classes or have already taken part in them, reading the entire article will be more informative than my personal observations. All quotes come from the article written by Rev. Dr. Hird. This is the problem with Christianity today. No one believes the roots or heritage of a practice has any influence on what they ‘think’ they are doing. Because Sha’ul (Paul) said that ‘idols’ have no influence on us, it is deceptively believed we can embrace ‘other gods’ with no consequences. However, Sha’ul also said, “If the root is holy, then so are the branches” (Romans 11:16). This means that if the root is unholy and has its heritage in ‘other gods,’ then every branch that has emerged from that root is also unholy. Though the Scriptures outline ‘appointed times’ to worship and honor yod-hey-vav-hey, Christians are ignorant of their Biblical heritage. They embrace holidays like Easter and Christmas that have unholy roots and honor other gods, holidays with activities the Bible warns against. Well-meaning Christians claim they have detached the false gods from these holidays and put God into them. They forget Yahweh’s first commandment is to have ‘no other gods.’ Just because Yeshua died on the cross and disarmed the powers and principalities, doesn’t mean that those powers and principalities don’t continue to exist. They will until they are thrown into the lake of fire at the final judgment. This statement shocked me when I read it. Yoga is the Hindu word for salvation! Every time the word yoga is spoken, the Hindu word for ‘salvation’ is announced. Wow! Selah. Pause and reflect on this! Yoga is the Hindu word for salvation. How many Christians know the Hebrew word for salvation written in their Bibles? How many Christians know the given Hebrew name of their Savior is Yeshua and means ‘salvation’? Most don’t know and most likely don’t care as they go to their Hindu ‘salvation’ classes as faithfully as Sunday school. In Exodus 23:13, God says the names of ‘other gods’ are not even supposed to be on our lips. Joshua is told never to invoke or swear by the names of other gods (Joshua 23:7). This is the fullness of a false religion with a salvation message that is expressed in an outward work disguised as exercise. As one practices yoga, they are actually validating Hinduism in their lives. Being that yoga is the heart of Hinduism, what is happening to the heart of the individual who practices yoga? From my experience with numerous Christians, if I say I celebrate the Sabbath and don’t eat pork because I love God and want to obey His commandments, I am called a legalist or told I have denied the work Yeshua did on the cross. It doesn’t matter if I quote from John 14:15, “If you love me (Yeshua), you will obey my commandments,” or James 2:18, ‘Faith without works is dead’, I am the lost one who has stumbled into the bottomless pit of the Galatian error. Yet, the person who goes to the rec center and takes Hindu ‘work out your salvation’ classes is just exercising! When I read this statement, I immediately thought of Yeshua’s yoke being light and not a burden (Matthew 11:28-30). In rabbinical thought, a ‘yoke’ is following the teachings of a certain rabbi. 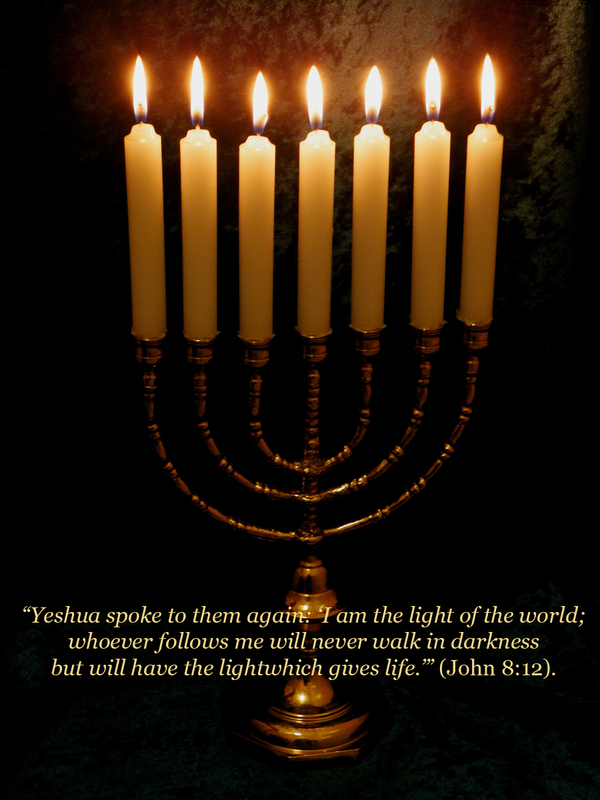 In the case of the Jewish Rabbi Yeshua, his ‘yoke’ is the Torah or the instructions of Yahweh, his Father. If yoga is the heart of Hinduism and comes from a word meaning ‘yoke,’ to what are those doing yoga yoking themselves? Most Christians would never ever consider ‘yoking’ themselves to Torah because that would be legalism, but yoking themselves to Hinduism through exercise is okay. They really aren’t consciously trying to have a psychic union with Brahman, the highest of Hindu deities, which is no different than celebrating Ishar or Saturnalia! “Unlike Christian prayer and meditation on God’s Word, the purpose of Eastern yogic meditational practices is to ‘kill the mind’. Through the Beatles infatuation with eastern religious practices, yoga infiltrated the western world. Because Americans have the right to ‘freedom of religion,’ this religious practice has flourished. Love is not sacrificial as God’s love, but an ‘all you need is humanistic love’ that feels good. ‘Imagine there is no heaven or God’ is still the enlightened one’s mantra for some manmade utopia that sin-infested people will never be able to attain. Our post-modern world tolerates religious cultures and beliefs to such an extent there is no purity of any religion. The merging of all religions into one lump of spiritual awareness has ‘killed the mind’ of the masses rather than ‘renewed the mind’ through the real Spirit of life Romans 12:2). There is little to no connection to a Creator because they, themselves have become gods and create their own spiritual universe with each individual at its center. This is more than polytheism, it is self-worship and idolatry at its pinnacle. My brother was born again into God’s Kingdom quite a few years ago. My brother’s faith walk was nothing short of amazing. The Scriptures he knew as a child came to life and the Spirit gave him immediate understanding. He felt his heart become circumcised and joy bubbled out of a new light in his eyes and countenance. He made restitution for numerous things from years before and enjoyed restoration of many broken friendships. His girlfriend immediately ended their relationship because she had an occult bent and wanted nothing to do with a ‘Jesus freak.’ Then, he met another woman. He was excited about her because she was ‘spiritual’ like he was. Unfortunately, her spirituality was embedded in Hinduism as she was a yoga instructor. Because my brother was still a baby believer and he didn’t want me to judge another of his girlfriends (every time I was right), he not only continued dating this woman, but he began to take part in yoga practices. He bought a mat, learned the many positions. Though he claimed it helped residual pain from a horrific car accident years earlier, it was really changing his life – his spiritual walk. Slowly, his demeanor changed. The light in his eyes wasn’t as bright and a different ‘spirit’ began guiding him that caused confusion in his soul and mind. Though he really liked this woman because of her ‘spirituality,’ she kept him at an uncomfortable distance. She intentionally used words with double meanings (semantics is definitely important) and secrecy to make her spirituality seem to be like his, but enough different that he needed to keep striving for more ‘light and peace.’ Though my brother could not see it, he slowly fell into a deception that still remains with him today. It will remain with him until he discerns the ‘spirits’ around her and took hold of him are not the same as the Spirit that was given to him by Yeshua. The ‘light and peace’ from the Spirit of Elohim is now hidden under a bushel barrel. Divination is the attempt to gain insight into a question or situation by way of an occultic practice or ritual. Divination is condemned by God in Leviticus 19:26. King Saul, when he disobeyed God’s command to destroy the Amalekites, was told by the prophet Samuel that his rebellion was like the sin of divination and his arrogance like idolatry. His rejection of the word of God and his disobedience made him lose his kingship over Isra’el (1 Samuel 15:23). Rejecting God’s Word is the same as idolatry and divination. As believers, we should flee from these things rather than try to rationalize our disobedience. We can lose the Kingdom just because we want to embrace our yoga-salvation exercises. When we returned home, I asked him what he was talking about. He had, at one time, become involved in TM. He received his mantra and offered his sacrificial apple on the white-table clothed altar. He had no idea his mantra was a ‘god,’ but he did forget it and had to get another. The yogi-dude was angry with him for forgetting. I asked him if he remembered the name of the ‘god.’ He did though he did not say the name because we both realized he had embraced a false god. My husband repented from ever taking part in this religious practice with its deceptive practices and other gods. Yeshua’s atonement for sin is the cornerstone of faith from Genesis through Revelation. Through his life, death and resurrection, we receive fullness of life now and into eternity. Anyone who does not trust in Yeshua’s atonement for their sin, does not receive the fullness of their faith – forgiveness and a restored relationship with their Creator. However, an individual does not have to openly worship a false god for it to impact their lives. This is the power of Astarte (Easter), Tammuz (Christmas trees), Samhain (Halloween) in the lives of Christians. These ‘gods’ and ‘goddesses’ have impacted their spiritual lives and hearts so much they will argue to the millionth power to defend their practices. My husband came to the reality of the impact of Hinduism on his life and identity; my brother needs to come to the same place. All of those who actively participate in yoga or its exercises also need to realize the subtle ways the Adversary uses to draw them into false religious practices in order to glorify himself. What Christians tend to forget is that we are commanded and warned against idolatry and ‘other gods’. Those commandments and warnings through the Torah, the Prophets and the Apostles are still in force until Elohim establishes his eternal throne in the New Jerusalem and there is a new heaven and a new earth. When we defile ourselves with false gods, we pay a huge price in our relationship with our Father. “When you offer your gifts … you continue to defile yourselves with all your idols to this day. Am I to let you inquire of me, you Israelites? As surely as I live, declares the Sovereign Lord, I will not let you inquire of me” (Ezekiel 20:31). You are currently browsing the archives for the The Ways of the Nations category.